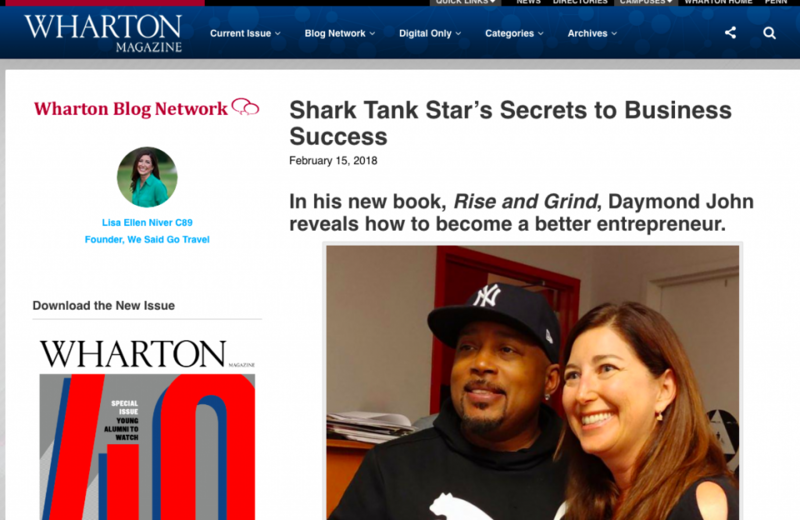 Thank you to Wharton Magazine for allowing me to share Daymond John’s Shark Tank Secrets to Success! 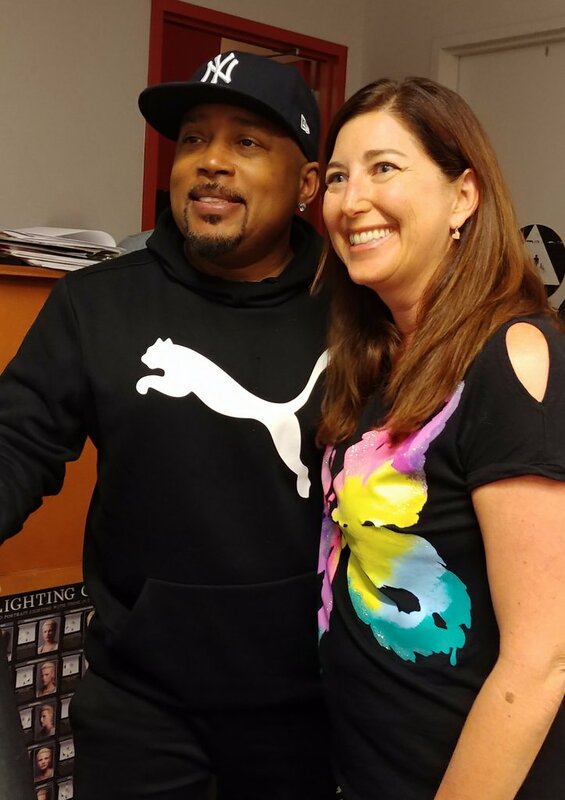 My favorite part of his conversation was when he talked personally about his journey. One of the most important things, John says, “is to take care of yourself. For Valentine’s Day, show how much you love yourself and take yourself to the doctor.” Many entrepreneurs do not make time for self-care but it is crucial. John followed a recommendation to have an executive physical. He said it seemed steep at upwards of $7,000 but it saved his life. The discovery and early detection of his stage two thyroid cancer meant he is now cancer-free after treatment. John said, “Be selfish. Be the best you can be so you can help those around you. It seems like selfish is a bad word but it is important. If you are not around, who will take care of your family?” The first thing on John’s personal priority list is to exercise and eat right. He schedules time to see his family and spend time with his daughters. If you do not set your priorities, other people will. Another great tip—don’t answer emails or look at social media when you wake up. 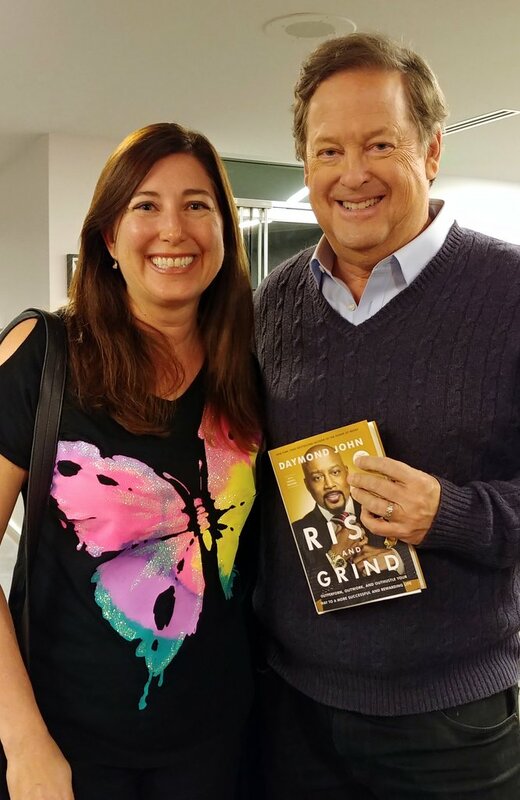 Sam Rubin from KTLA-TV was a marvelous moderator, taking John through topics of his personal life and some of the highlights from the 16 entrepreneurs featured in the book. John said, “We need methods and techniques to be more successful.” He initially began interviewing entrepreneurs as a means to find a smarter way to work. In the book, John shares the lessons he has learned and the answers to his questions about how to balance life. As he said, “Don’t major in minor. Delegate to amazing individuals on your team.” Make sure you are working on the most important projects that really need your focus each day, he said. John spoke about how you have to find your own way to make things work. He personally reads his 10 goals every morning and night to make sure he stays on track. Fellow “Shark” Barbara Corcoran has different sets of goals, with an A and B track. Grammy-winning musician Carlos Santana reads from several inspiring books every morning when he wakes up and at night before going to bed. Santana explains in the book: “It’s like when you get in the car, and you make sure the mirrors are all set. You check the driver-side mirror, the passenger-side mirror, the rearview mirror. You make sure they’re set just right for you, so you can see what’s coming from the back, from the left, from the right. It’s all aligned for you so you can protect yourself. What do they say when you’re learning to drive, that you should know what’s going on seven cars ahead of you, and seven cars behind you?” I love this metaphor about being prepared and on the road for success. Navigate. The key is navigating those larger journeys in life and moving with speed and precision, like a killer shark in the water. Keep your eyes on where you want to get to in life—your goals, your passions, your dreams—and keep moving in that direction with fury and purpose when necessary. Desire, drive, determination to accomplish the outcomes you set out in front of them. What choices will you make to fill your 86,400 seconds each day in a meaningful way? 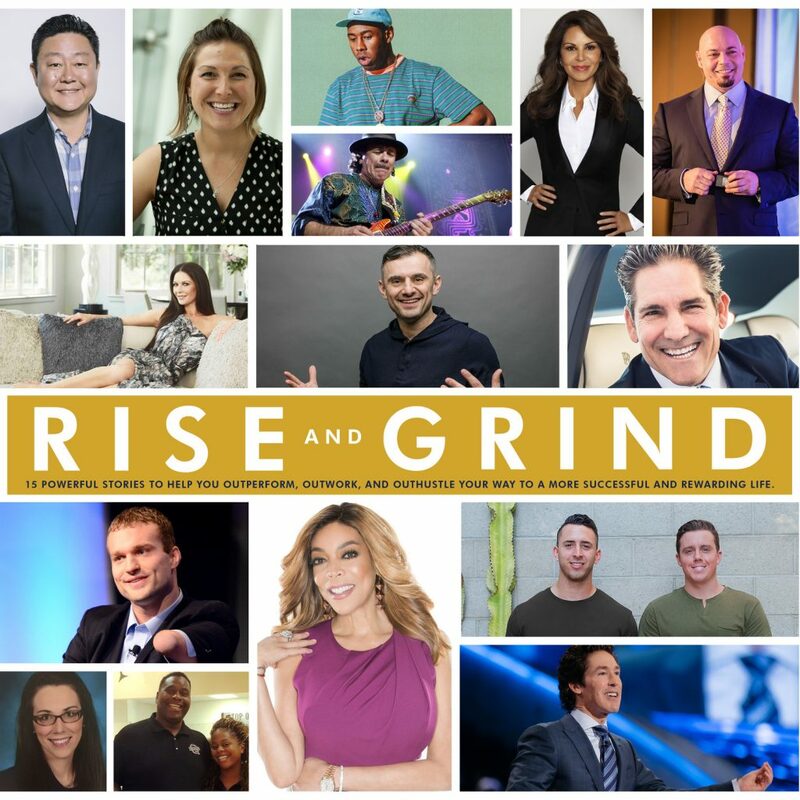 Learn more about what Lisa thought about Rise and Grind here. 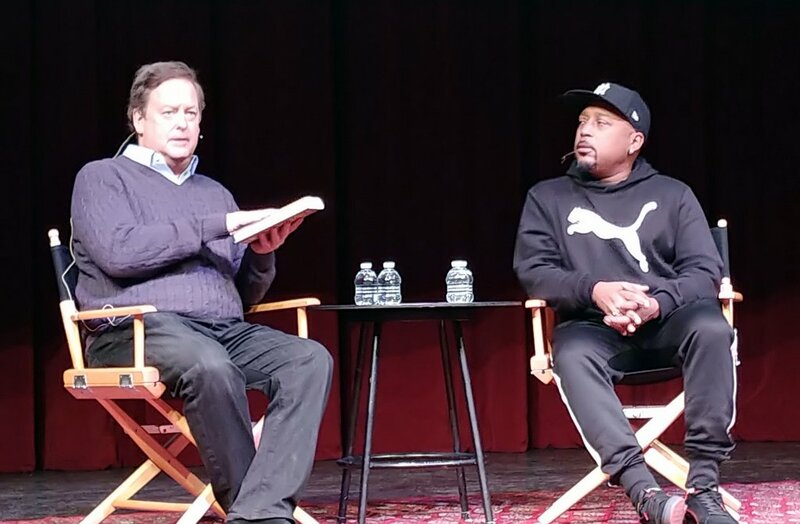 Thank you to Live Talks Los Angeles for including me in this wonderful event!